Take a trip down not the rabbit hole but to Kirby Hall as a children’s favourite will be performed in the grounds of the stately home later this week. Alice’s Adventures in Wonderland will be presented by the Chapterhouse Theatre Company and based on the characters and story of the classic Lewis Carroll novel. 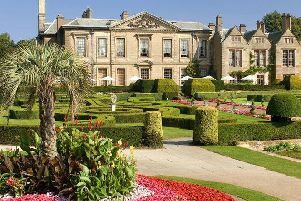 The company is delighted to be bringing Alice’s Adventures in Wonderland to Kirby Hall, a beautiful Elizabethan house that was once owned by Sir Christopher Hatton, Lord Chancellor to Elizabeth I. Join Alice as she stumbles into the magical world of Wonderland and meet a whole host of colourful characters. From the unforgettable White Rabbit and the madcap Mad Hatter to the terrifying Queen of Hearts, Alice’s journey couldn’t be filled with more adventure. Presented in beautiful Victorian costume and alive with song, dance and original music, this is a production to delight the entire family in some of the UK and Ireland’s most stunning open-air theatre venues. Chapterhouse Theatre Company is now in its 19th year of touring open-air theatre to stunning country houses, castles and heritage sites across the UK and Ireland. From the first year of performances at 30 venues with Romeo and Juliet in 2000, Chapterhouse now visits over 180 venues every year, and has become a greatly anticipated addition to thousands of theatre-goers’ calendars. The performance starts at 7pm with the gates opening at 6pm. People are advised to bring your own rugs or low-backed seating. They cost £16 for adults, £10 for children and £46 for a family ticket consisting of two adults and two children. They can be booked by calling either the English Heritage Booking Line on 0370 333 1181, See Tickets on 0871 220 0260 or by visiting www.seetickets.com.